https://jazzdinosaur.files.wordpress.com/2012/11/voltajazz_fintalabo.mp3Partly to welcome our new friends from Burkina Faso, and partly to satisfy my own need for new sounds, I availed myself of the bounty of the internet and found this excellent cut by Volta Jazz of Burkina Faso. 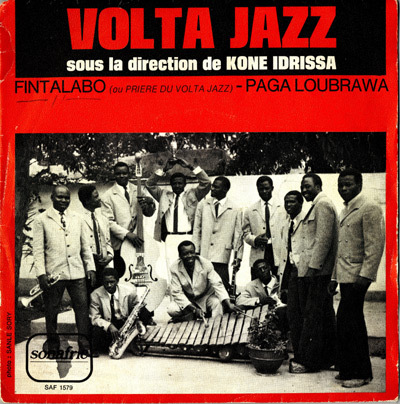 The song entitled Fintalabo and composed by Kone Idrissa was posted to the VOM website by by Mathew Lavoie. The tune begins with a simple guitar statement of the pentatonic melody theme echoed a moment later by the trumpet and sax accompanied by a lilting bass line. The harmony is understated throughout with chords outlined by the marimba (?) and sometimes guitar. Then some vocal call and response with the micro-tone blues inflections that have now evolved together but apart on (at least) two continents. Then a bluesy guitar solo followed by a restatement of the theme by the horns. Just when you think these guys are played-out, there is a great vocal stop-time that explodes into a bunch more percussion and a sax solo over a rolling 6/8 with that sounds like something Elvin would lay down for the Coltrane 4-tet. It’s simple, powerful, and beautiful. According to Mathew’s article , the group formed in 1964 in Bobo-Dioulasso under the direction of guitar player Kone, and won the Grand Prix du Premier Cercle d’Activites Literaires et Artistique de Haute-Volta, Burkina’s highest cultural award. Very little additional info on Kone or the group on the interwebs save this article on World Service.